Often it is important to step back from something and evaluate why you got into it in the first place. At those times, sometimes the best practice in humility is to take a step back so that you can regain the passion that you risked losing. To take a break and shift focus to important things in life and regain perspective. It's not quitting. It's realignment. I didn't quit last weekend at Ironman Boulder, despite the fact that, leading up to the race, I was becoming burned out by training for an Ironman. I didn't hold back, I still gave it my all, and as I look back on this experience, I will once again look back on pride that I finished something difficult that I set out to achieve. Each race offers a new experience that I would not expect. You would think that after four full Ironmans that I would have a good grasp on what to expect. Nothing could be farther from the truth. Each experience is significantly different, and you do not know what to expect until you are right in the middle of it. Another set of challenges, another goal achieved. My shortcomings in this race are put into perspective by the stories of others who crossed the finish line with more significant, inspiring, and more meaningful stories to tell. Too many to list here, but they are such that I am reminded that, while I didn't achieve all of my goals, I finished. And I finished with two arms, two legs, and a fully functional body. For that I am fortunate. Such is this sport that reminds us of what we're truly capable of, and to celebrate that. It was announced the morning of the race that the swim would be wetsuit optional. This meant that a person could choose to wear a wetsuit, but to wear one would mean forfeiting any opportunity at age group awards or Kona slots. I knew that this was a possibility, but I hadn't prepared for it. After struggling through the IM Texas non-wetsuit swim in May, I was looking forward to a comfortable wetsuit swim in Boulder. After all, every other race at the Boulder Reservoir in August in the past had been wetsuit legal. Why expect that this year would be an outlier? Lesson learned, plan for everything. Being that I wasn't mentally prepared to swim without a wetsuit, I had a lot of soul searching to do. I had to take another look at what my goals were for this race and then make a decision. 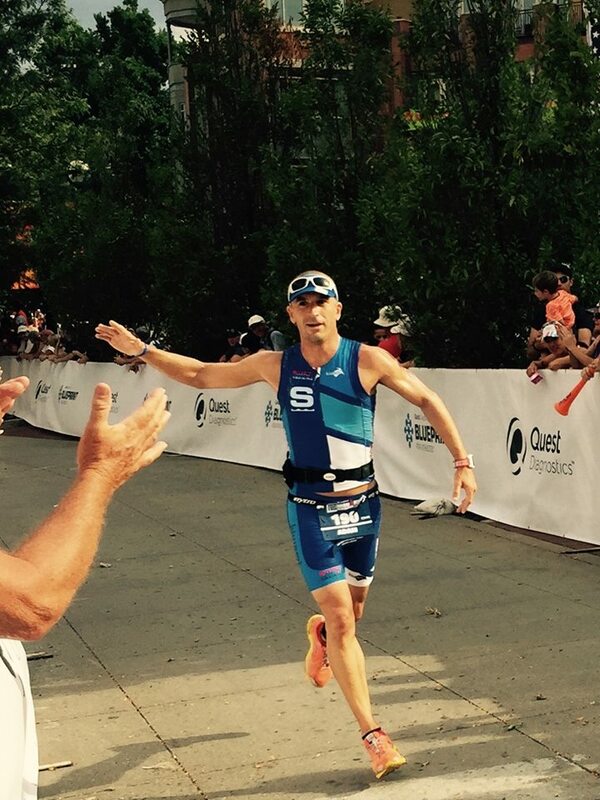 Qualifying for Kona has been a goal of mine, and I know I have what it takes to do so with a perfect day. But after my experience in Texas, I recognized that I would not have a "perfect day" if the swim was non-wetsuit. The fact that I had not trained for it, and the fact that we were at altitude would have a significant affect on my swim time and likely demoralize me for the rest of the race. So the goal really became to run the best race I possibly could. In retrospect, it's easy to say I should have taken the bold step to join the non-wetsuit swimmers, but in looking at what my motives should be in triathlon, the only person I am competing against is myself. With that perspective, I can never lose as long as I make forward progress. On the other hand, if I "shoot for Kona", I am setting myself up for anxiety, expectation, and disappointment. Kona would be a dream come true, but must remain a secondary benefit to performing at my personal best. So I chose to wear the wetsuit, and I'm glad I did. The swim was chaos. Instead of a trickle of people at a time getting into the water during the rolling start, it turned into a flood of people. 3000 athletes started the race within 10 minutes, which equates to a "mass start" in my book. This lead to constant contact and combat for the first mile and a half. Unfortunately for the non-wetsuit wave, this meant that a sea of neoprene was consuming them within minutes. My swim lasted 1:12, a best for me, excluding Ironman Cabo which was current assisted. Aside from the pandemonium that existed with the other racers, the water was calm, and the conditions were perfect for a good swim. Onto the bike and I didn't give myself any expectations. I had heard that the course was fast, but hillier than last year. I had ridden some of the course in the days before hand, and found that the hills were short but taxing, so I planned on taking it easy up them. The first 10-15 miles were all familiar, as they followed the course from the previous year. Around mile 20, I had already noticed that I was beginning to feel exhausted and a bit "off". I'm not sure what was wrong with me, but I just wasn't feeling right. So my plan became to make sure that I was getting my nutrition and hydration in at the appropriate times. I was successful at this, and nailed every part of my nutrition plan. I was through the first 56 miles in about 2:24 so I was once again on track for a sub-5 hour IM ride. This time, though, I wasn't counting on it. I simply wanted to ride within myself so that I could run well and finish at my best. Unfortunately, as I went through about mile 70, my "off" feeling was elevating. I still wasn't sure how to describe it, but it just felt like I couldn't perform at my best, and riding at my normal effort resulted in extreme fatigue. So I pressed on at about 80% of normal, which felt about right. I dismounted the bike at about 4:53, just shy of a bike PR, but I'm very happy with this, since it was much hillier than Texas. On to the run and I left T2 crying uncontrollably. I wasn't feeling overly emotional, no. But before I left T2, the sunscreen volunteer asked if I wanted sunscreen on my nose, to which I mistakenly answered "sure, why not". I spent the next 5 minutes struggling through trying to evacuate all of the burning sunscreen from my eyes, rather unsuccessfully I might add. After righting that, I fell into a good rhythm at around a half mile, and was quickly caught by a bike announcing the arrival of the 2nd place female, who happened to be one of my teammates. I paced her for a time, but recognized that she had a much faster pace than I had, so I fell back into my own pace. Through the first two miles, my "off"ness turned into straight up queasiness and dizziness. I usually hit my dark part of the marathon at around mile 18-19, but now it was coming at mile 3. Realizing that I had 23 miles to go, and not knowing if I faced dehydration or body shutdown, I for the first time, questioned my ability to continue. I thought of dropping out. I thought of quitting. The early cheers of the crowd saying "you look strong!" turned into "are you okay?" In fact, Tim Don, world champion triathlete even asked if I was doing ok as I stumbled by him. I walked through the next few miles until I once again reached the support of the downtown crowd support. The support fueled me to a slow run, which I held through about mile 15 (walking the aid stations). I passed by my family a number of times, making sure to appear strong so that they wouldn't worry. A note about having family or friends at a race. Without their support, I would have never been able to continue. Their support fueled me all the way through this. Once again, I was at the bottom of the river trail, and faced with walking, but at this point I at least knew that I only had 10 miles remaining. One more trip up the hill, and a quick two miles and I would be finished with this thing. Fortunately, my stomach was feeling better, but my legs were just not cooperating today. The combination of run/walking got me back up the hill. It was clear that the early onset fatigue I would feel on my long runs during me peak training was catching up with me. Despite training for over 20 hours per week, I didn't benefit from the run training. In fact, it became damaging to my running strength. That damage was showing its ugly head now. Mile 24 is my favorite part of this race. The reason is that I reach the peak of the hill and begin to run downhill. The last 2-3 miles are downhill, through a sea of supporters and then through downtown to the finish. My 10 minute miles turned into 8 minute miles, and I felt effortless. Such is the power of the mind to limit the body and spirit. I finished in a time of 10:52, thus putting a cap on my fourth Ironman. I was grateful to be done for a number of reasons, but most importantly because it was not time to recharge. I need to spend some time away from 20+ hour training weeks, and more time rejuvenating my body and spirit. I need to start missing this sport so that I can return to it more energized and passionate about why I do this in the first place, lest I become more fully burned out by the sport. There are a number of things that I took from this race experience. 1. The brain truly is a limiter. I wrote a blog post on this a number of months ago. This season I raced more with my brain and less with my spirit. I need to train and race more with my spirit. 2. I need to spend this offseason realigning myself with the spiritual nature of why I train and race triathlons. 3. Nothing can compare to the power of family and friends present to support me during a race. I was fortunate to have my wife, kids, and parents at this race and their energy pushed me through some really dark times. I don't think I could have finished without them there. 4. It's time to become a better runner. I accomplished a number of goals I set out to accomplish this past year. I wanted to become a better swimmer. I did that by knocking off 20 seconds off of my average pace per 100 yards in the pool, and conquering a fear of swimming without a wetsuit. I have also become a good cyclist. I have surpassed where I thought I would be by this time on the bike, clocking two sub-5 hour Ironman bike legs this year. This year my run has been my weak spot. While I would bike myself into age group award contention, I would fade significantly on the run. It's time to put away the bike for a while and focus on run volume training so that I will be more effective in the coming years. 5. I am going to focus on the 70.3 distance for a while. In an effort to get faster, I need to step away from the full distance for a while in order to become a better triathlete. Training for halves give me the capacity to be flexible with my training so that I'm not constantly overloaded. I still have a goal to qualify for Kona, and I think stepping back from the full distance for a while is the best way to achieve this in the long term. In the meantime, I'm going to have fun training for and racing the shorter distance. I want to thank everyone who supported me through over the last couple years as I began training and racing. Without the support of those who believed in me, I couldn't have achieved half of what I have. To have gone from an unhealthy ball of negativity to the healthy and joyful person I am now is an absolute blessing, and it is only by grace that I have come this far.